What was the importance of the watch to the author? What were the attempts made by the author to get his watch repaired? After a possession of 18 months, the author let his watch run down. Devastated, the author went to all possible watch makers starting from the chief jeweller, the very next day. The head of the establishment pushed the regulator of the watch a little too much, which did no good, rather worsened its condition. Then the author went to another watch maker who kept it for a week and slowed it down, however, too much. Then he went to another one who kept it for three days; and then couple of more. Even after having spent thousands dollars, none of the watch makers could fix the watch. Hopeless, the author gave it a last shot and went to a watch maker who turned out to be an erstwhile, not a good, steam-boat engineer. It was now that the author realised that "a good horse was a good horse until it had run away once, and that a good watch was a good watch until the repairers got a chance at it. " Why did the author finally give up on his watch? What was Uncle Williams’ comment on the ‘tinkerers’ of the world? (c) The seventh time the author took the watch to a watch maker, he reckoned the apprentice to be an old acquaintance, a steam-boat engineer of other days and not a good engineer. Like all watch makers, he diagnosed and gave his verdict. The author observed keenly and judged him at his very verdict when he said, "She makes too much steam-you want to hang the monkey wrench on the safety valve! The author immediately remembered what his uncle William used to say and perceived that a tinker is a tinker after all, this being an unsuccessful engineer and wondered like his uncle what became of all the unsuccessful tinkers. Replacing old machines with new is better than getting them repaired. It is difficult to part with personal items like a watch which have a sentimental value attached to them. How is humour employed to comment on the pains that the author took to get his watch set right? ‘The author’s treatment of the subject matter makes the readers identify themselves with the experience.’ Comment on this statement. Identify some of the improbable images the author has used to effect greater humour. Why does Russell call the three passions ‘simple’? The essay actually is the preface to Bertrand Russell's autobiography. Every human is driven by a force, a passion all her/his life. It keeps her/him going. Some desire money, other, fame. There are some who desire simple satisfaction. Bertie's desires that he chased through his life were simple as well. He was driven by passions that any ordinary man or woman might feel for. For one, he wished love and got it too; he believed that it brought ecstasy. He got married four times to tell. Second, he hungered for knowledge and of course we all seek for it. He was a mathematician, a logician, political activist and wrote vastly on philosophy and contributed to literature, for which he received Nobel Prize as well. Third, he shared "an unbearable pity for the suffering of mankind". He took a stand against World War 1 and Vietnam war. Any human will pity a suffering man or a woman for they have a heart and feel, and so did Russell. Russell was a man who did not lust after materialistic gains; he was born in a prominent aristocratic family of Britain and gave away much of what he inherited. He rose his voice in favour of suffragists and world government. He believed in free thought in religion and morals. Why has he compared the three passions to great winds? What, according to Russell, is the importance of love in life? How does Russell’s definition of knowledge differ from what is commonly understood by the term?Why is the quality of pity earth-bound while the other two passions are elevating? Why is the quality of pity earth-bound while the other two passions are elevating? How have the three passions contributed to the quality of Russell’s life? The play begins in the bedroom of Raina Petkoff in a Bulgarian town in 1885, during the Serbo-Bulgarian War. As the play opens, Catherine Petkoff and her daughter, Raina, have just heard that the Bulgarians have scored a tremendous victory in a cavalry charge led by Raina's fiancé, Major Sergius Saranoff, who is in the same regiment as Raina's father, Major Paul Petkoff. Raina is so impressed with the noble deeds of her fiancé that she fears that she might never be able to live up to his nobility. At this very moment, the maid, Louka, rushes in with the news that the Serbs are being chased through the streets and that it is necessary to lock up the house and all of the windows. Raina promises to do so later, and Louka leaves. But as Raina is reading in bed, shots are heard, there is a noise at the balcony window, and a bedraggled enemy soldier with a gun appears and threatens to kill her if she makes a sound. After the soldier and Raina exchange some words, Louka calls from outside the door; she says that several soldiers want to search the house and investigate a report that an enemy Serbian soldier was seen climbing her balcony. When Raina hears the news, she turns to the soldier. He says that he is prepared to die, but he certainly plans to kill a few Bulgarian soldiers in her bedroom before he dies. Thus, Raina impetuously decides to hide him. The soldiers investigate, find no one, and leave. Raina then calls the man out from hiding; she nervously and absentmindedly sits on his gun, but she learns that it is not loaded; the soldier carries no cartridges. He explains that instead of carrying bullets, he always carries chocolates into battle. Furthermore, he is not an enemy; he is a Swiss, a professional soldier hired by Serbia. Raina gives him the last of her chocolate creams, which he devours, maintaining that she has indeed saved his life. Now that the Bulgarian soldiers are gone, Raina wants the "chocolate cream soldier" (as she calls him) to climb back down the drainpipe, but he refuses to; whereas he could climb up, he hasn't the strength to climb down. When Raina goes after her mother to help, the "chocolate cream soldier" crawls into Raina's bed and falls instantly asleep. In fact, when they re-enter, he is sleeping so soundly that they cannot awaken him. Act II begins four months later in the garden of Major Petkoff's house. The middle-aged servant Nicola is lecturing Louka on the importance of having proper respect for the upper class, but Louka has too independent a soul to ever be a "proper" servant. She has higher plans for herself than to marry someone like Nicola, who, she insists, has the "soul of a servant." Major Petkoff arrives home from the war, and his wife Catherine greets him with two bits of information: she suggests that Bulgaria should have annexed Serbia, and she tells him that she has had an electric bell installed in the library. Major Sergius Saranoff, Raina's fiancé and leader of the successful cavalry charge, arrives, and in the course of discussing the end of the war, he and Major Petkoff recount the now-famous story of how a Swiss soldier escaped by climbing up a balcony and into the bedroom of a noble Bulgarian woman. The women are shocked that such a crude story would be told in front of them. When the Petkoffs go into the house, Raina and Sergius discuss their love for one another, and Raina romantically declares that the two of them have found a "higher love." When Raina goes to get her hat so that they can go for a walk, Louka comes in, and Sergius asks if she knows how tiring it is to be involved with a "higher love." Then he immediately tries to embrace the attractive maid. Since he is being so blatantly familiar, Louka declares that Miss Raina is no better than she; Raina, she says, has been having an affair while Sergius was away, but she refuses to tell Sergius who Raina's lover is, even though Sergius accidently bruises Louka's arm while trying to wrest a confession from her. When he apologizes, Louka insists that he kiss her arm, but Sergius refuses and, at that moment, Raina re-enters. Sergius is then called away, and Catherine enters. The two ladies discuss how incensed they both are that Sergius related the tale about the escaping soldier. Raina, however, doesn't care if Sergius hears about it; she is tired of his stiff propriety. At that moment, Louka announces the presence of a Swiss officer with a carpetbag, calling for the lady of the house. His name is Captain Bluntschli. Instantly, they both know he is the "chocolate cream soldier" who is returning the Major's old coat that they disguised him in. As they make rapid, desperate plans to send him away, Major Petkoff hails Bluntschli and greets him warmly as the person who aided them in the final negotiations of the war; the old Major insists that Bluntschli must their houseguest until he has to return to Switzerland. Act III begins shortly after lunch and takes place in the library. Captain Bluntschli is attending to a large amount of confusing paperwork in a very efficient manner, while Sergius and Major Petkoff merely observe. Major Petkoff complains about a favorite old coat being lost, but at that moment Catherine rings the new library bell, sends Nicola after the coat, and astounds the Major by thus retrieving his lost coat. When Raina and Bluntschli are left alone, she compliments him on his looking so handsome now that he is washed and brushed. Then she assumes a high and noble tone and chides him concerning certain stories which he has told and the fact that she has had to lie for him. Bluntschli laughs at her "noble attitude" and says that he is pleased with her demeanor. Raina is amused; she says that Bluntschli is the first person to ever see through her pretensions, but she is perplexed that he didn't feel into the pockets of the old coat which she lent him; she had placed a photo of herself there with the inscription "To my Chocolate Cream Soldier." At this moment, a telegram is brought to Bluntschli relating the death of his father and the necessity of his coming home immediately to make arrangements for the six hotels that he has inherited. As Raina and Bluntschli leave the room, Louka comes in wearing her sleeve in a ridiculous fashion so that her bruise will be obvious. Sergius enters and asks if he can cure it now with a kiss. Louka questions his true bravery; she wonders if he has the courage to marry a woman who is socially beneath him, even if he loved the woman. Sergius asserts that he would, but he is now engaged to a girl so noble that all such talk is absurd. Louka then lets him know that Bluntschli is his rival and that Raina will marry the Swiss soldier. Sergius is incensed. He sees Bluntschli and immediately challenges him to a duel; then he retracts when Raina comes in and accuses him of making love to Louka merely to spy on her and Bluntschli. As they are arguing, Bluntschli asks for Louka, who has been eavesdropping at the door. She is brought in, Sergius apologizes to her, kisses her hand, and thus they become engaged. Bluntschli asks permission to become a suitor for Raina's hand, and when he lists all of the possessions which he has (200 horses, 9600 pairs of sheets, ten thousand knives and forks, etc. ), permission for the marriage is granted, and Bluntschli says that he will return in two weeks to marry Raina. Succumbing with pleasure, Raina gives a loving smile to her "chocolate cream soldier." 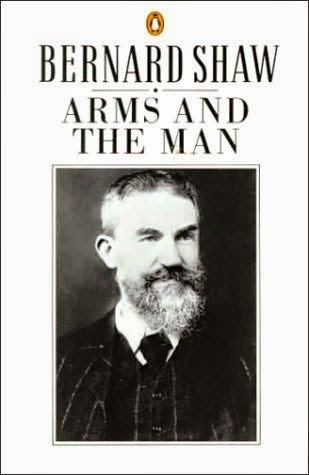 One of Shaw's aims in this play is to debunk the romantic heroics of war; he wanted to present a realistic account of war and to remove all pretensions of nobility from war. It is not, however, an anti-war play; instead, it is a satire on those attitudes which would glorify war. To create this satire, Shaw chose as his title the opening lines of Virgil's Aeneid, the Roman epic which glorifies war and the heroic feats of man in war, and which begins, "Of arms and the man I sing. . . ."
When the play opens, we hear about the glorious exploits which were performed by Major Sergius Saranoff during his daring and magnificent cavalry raid, an event that turned the war against the Serbs toward victory for the Bulgarians. He thus becomes Raina Petkoff's ideal hero; yet the more that we learn about this raid, the more we realize that it was a futile, ridiculous gesture, one that bordered on an utter suicidal escapade. In contrast, Captain Bluntschli's actions in Raina's bedroom strike us, at first, as being the actions of a coward. (Bluntschli is a Swiss, a professional soldier fighting for the Serbs.) He climbs up a water pipe and onto a balcony to escape capture, he threatens a defenseless woman with his gun, he allows her to hide him behind the curtains, and then he reveals that he carries chocolates rather than cartridges in his cartridge box because chocolates are more practical on the battlefield. Yet, as the play progresses, Bluntschli's unheroic actions become reasonable when we see that he survives, whereas had the war continued, Sergius' absurd heroic exploits would soon have left him dead. Throughout the play, Shaw arranged his material so as to satirize the glories associated with war and to ultimately suggest that aristocratic pretensions have no place in today's wars, which are won by using business-like efficiency, such as the practical matters of which Bluntschli is a master. For example, Bluntschli is able to deal with the business of dispensing an army to another town with ease, while this was a feat that left the aristocrats (Majors Petkoff and Saranoff) completely baffled. This early play by Shaw, therefore, cuts through the noble ideals of war and the "higher love" that Raina and Sergius claim to share; Arms and the Man presents a world where the practical man who lives with no illusions and no poetic views about either love or war is shown to be the superior creature. Captain Bluntschli: A professional soldier from Switzerland who is serving in the Serbian army. He is thirty-four years old, and he is totally realistic about the stupidity of war. Raina Petkoff: The romantic idealist of twenty-three who views war in terms of noble and heroic deeds. Sergius Saranoff: The extremely handsome young Bulgarian officer who leads an attack against the Serbs which was an overwhelming success. Major Petkoff The inept, fifty-year-old father of Raina; he is wealthy by Bulgarian standards, but he is also unread, uncouth, and incompetent. Catherine Petkoff: Raina's mother; she looks like and acts like a peasant, but she wears fashionable dressing gowns and tea gowns all the time in an effort to appear to be a Viennese lady. Louka The Petkoffs' female servant; she is young and physically attractive, and she uses her appearance for ambitious preferment. Nicola: A realistic, middle-aged servant who is very practical. Identify the common characteristics shared by tribal communities all over the world. The essayist identifies some common characteristics shared by tribal communities all over the world. The tribals live in groups that are cohesive and organically unified. They show very little interest in accumulating wealth or in using labour as a device to gather interest and capital. The tribals accept a world view in which nature, human beings and God are intimately linked and they believe in the human ability to spell and interpret truth. They live more by intuition than reason, they consider the space around them more sacred than secular, and their sense of time is personal rather than objective. What distinguishes the tribal imagination from the secular imagination? The tribal imagination is, according to the author, dreamlike and hallucinatory. It admits fusion between various planes of existence and levels of time in a natural way. These characteristics distinguish the tribal imagination from the secular imagination. In tribal stories, oceans fly in the sky as birds, mountains swim in the water as fish, animals speak as humans and stars grow like plants. In tribal imagination, stars, seas, mountains, trees, men and animals, can be angry, sad or happy. How does G.N. Devy bring out the importance of the oral literary tradition? G. N. Devy brings out the importance of the oral literary tradition by referring to the richness of the works of the tribals that have been handed down from one generation to the other orally. He tries to bring home the point that though the literary compositions have been transmitted orally yet thematically and ornamentally they are very rich. The stories and songs that have come down to the tribals through oral tradition are unique. These compositions present the exclusive world view of the tribals. He points out that the wealth and variety of these works is very enormous. In order to show the importance of the oral literary tradition, Devy throws light on the various characteristics of the tribal arts. He shows that one of the main characteristics of tribal arts is their distinct manner of constructing space and imagery, which might be described as hallucinatory. Playfulness is another dimension of this tradition. Devy advocates that proper recognition should be given to the oral literary tradition in view of its variety and richness. List the distinctive features of the tribal arts. According to the essayist G. N. Devy, the tribal arts display many distinctive features. One of the distinctive features of tribal arts is their distinct manner of constructing space and imagery, which might be described as 'hallucinatory'. In both oral and visual forms of representation, tribal artists seem to interpret verbal or pictorial space as demarcated by an extremely flexible 'frame'. The boundaries between art and non art become almost invisible. In a tribal Ramayana, an episode from the Mahabharata makes a sudden and surprising appearance; tribal paintings contain a curious mixture of traditional and modern imagery. The tribal arts follow strict convention. Every tribal performance and creation has, at its back, another such performance or creation belonging to a previous occasion. The creativity of the tribal artist lies in adhering to the past while, at the same time, slightly subverting it. Playfulness is the soul of tribal arts. The tribal arts rarely assume a serious or pretentious tone. The tribal arts are relaxed and never tense. The tribal oral stories and songs employ bilingualism in a complex manner. ‘New literature’ is a misnomer for the wealth of the Indian literary tradition. How does G.N. Devy explain this? According to the essayist, the tribal Literature should not be called 'New Literature' as this has been in existence for many years. The songs and stories of the tribals have been transmitted orally and as these have not been written down so many people have been unaware of them. The essayist contradicts the views of the western literary critics who have termed tribal literature as 'New Literature'. He says that there is nothing new in this, what might be new is the present attempt to see imaginative expression in tribal language not as folklore but as literature and to hear tribal speech not as a dialect but as a language. How does Shelley’s attitude to science differ from that of Wordsworth and Keats? "Up! up! my Friend, and quit your books;"
Wordsworth requests us to be more inclined towards Nature because there is more wisdom in it. Keats in his poem 'Lamia' talks of two facets of human nature: one is sensual and other emotional. Keats calls philosophy destructive and pleasure unreal and calls them inseparable. However, it is not that one must take Wordsworth's and Keat's take as absolute. Shelley, for instance, is of a different opinion. For scientists it is best if they consider Shelley. A. N. Whitehead's testimony called Shelley's attitude to Science, an opposite pole to that of Wordsworth. He loved science, and was never tired of expressing in poetry the thoughts, which it suggests. Science symbolised to him joy, and peace, and illumination. ‘It is not an accident that the most discriminating literary criticism of Shelley’s thought and work is by a distinguished scientist, Desmond King-Hele.’ How does this statement bring out the meeting point of poetry and science? What do you infer from Darwin’s comment on his indifference to literature as he advanced in years? Darwin, a great scientist, known for his work On the Origin of Species, enjoyed literature only until he was 30, as he said. He enjoyed poetic works of Byron, Coleridge, Shelley, etc. immensely. Shakespeare's historical plays gave him much pleasure. However, as he advanced in his age to reach the benchmark of 30, the charm faded and he began losing interest in pictures and music that once gave him great delight. He tried reading poetry and Shakespeare; however, he found it so intolerably dull that it nauseated him. It is surprising that the answer to this change is in Darwin's own statement. His mind had become some kind of a &#160;grinding machine to process laws out of facts. It caused atrophy of that part of the brain on which higher tastes depended. It was hard for Darwin to infer it as well and, thus, his romance with literature died away. How do the patterns of creativity displayed by scientists differ from those displayed by poets? What is the central argument of the speaker? In the essay patterns of creativity, S. Chandrasekhar tries to figure out the reason for the difference in the patterns of creativity among the practitioners in the arts and practitioners in the sciences. He did not answer it, rather, he made an assortment of remarks that bore the answer. He cites examples explaining how poets and scientists view each other defining the difference in their views. There are poets such as Wordsworth and Keats who are worshippers of nature, who believe that humans sabotage nature by the technological advancement. However, there are poets like Shelley, who do poetry on science. It is difficult to segregate the views and put them into water tight compartments. Darwin, for instance enjoyed literature immensely as it gave him utmost joy, but only till the age of 30. W. B. Yeats, in praise of Shelley's A Defence of Poetry, called it the profoundest essay on the foundation of poetry in the English language The author of the essay, Chandrasekhar wonders in the end that why is there no such A Defence of Science written by a scientist of equal endowment. Perhaps the answer to the question he knew already. ‘Poets are the unacknowledged legislators of the world’. Poetry and science are incompatible. How does the ‘assortment of remarks’ compiled by the author give us an understanding of the ways of science and poetry? Considering that this is an excerpt from a lecture, how does the commentary provided by the speaker string the arguments together? The Cloud ‘fuses together a creative myth, a scientific monograph, and a gay picaresque tale of cloud adventure’— explain. What clues did Sherlock Holmes work upon to get at the fact that the story of the three Garridebs was a ruse? Sherlock Holmes noticed that the gentleman who was paying visit to him and his friend Watson under the name of John Garrideb was not what he purported to be because there were discrepancies in his statements as well as appearance. John Garrideb’s claim that he was new to London was not true because the dress that he was wearing was British and that too a worn out one. John’s accent also hinted that he was staying in London for quite some time. Moreover John’s story about Alexander Hamilton Garrideb of Chicago fell flat when he claimed that he knew Dr. Lysander Starr of Topeka very well, a bait cleverly placed by Holmes. Sherlock Holmes also noticed that the advertisement shown to him by John Garrideb apparently placed by Howard Garrideb contained words which were mainly used in USA, proving that it was none other than John Garrideb himself who placed the advertisement. All the above mentioned discrepancies proved that the story of three Garridebs was a ruse. What was John Garrideb’s objective in inventing the story of Alexander Hamilton Garrideb and his legacy? John Garrideb's objective was to gain entry into the house of Nathan Garrideb. He wanted to enter the house because before Nathan Garrideb the house was rented to Presbury, the American criminal, who was running a racket of counterfeit British notes and currencies in a secret basement in the house of Nathan Garrideb. John and Presbury being friends back then worked in tandem and knew about each others' secrets. When John shot Presbury dead he wanted to lay his hands on the counterfeit notes printing machine and currencies lying hidden in the basement of the house where Nathan Garrideb lived. But Nathan Garrideb proved a hindrance in his planning for he hardly left his dwellings. This led John Garrideb to invent the story of Hamilton Garrideb and his legacy. Nathan Garrideb almost fell in the trap except the fact that he got over enthusiastic and involved Holmes in the hunt of the third Garrideb. Why didn't John Garrideb like the idea of including Holmes in the hunt for the third Garrideb? John Garrideb didn't like the idea of including Holmes in the hunt for the third Garrideb because he feared that his fictitious story of three Garridebs might get busted. His worst fears came true at the end, because Holmes noticed all the discrepancies in his statements and pinned down John Garrideb while he was entering the basement of Nathan Garrideb's house to take away the counterfeit currencies. Who was Roger Presbury and how was John Garrideb connected with him? Roger Presbury was an American criminal who was living in Britain and was involved in counterfeit currency business. He was shot by John Garrideb over cards in a night club on the Waterloo Road in January, 1895. Sherlock found out that his appearance matched with the appearance of Waldron, the previous tenant of the lodging in which now Nathan Garrideb lived. Presbury aka Waldron had hidden a note printing press in his basement and John Garrideb knew about it. It was this printing press that John Garrideb was after and carved out the whole plan to acquire it. How did Holmes guess that John Garrideb would go to 136, Little Ryder Street? Did he expect to find what he ultimately did before he went there? Once it became clear to Holmes that John Garrideb wants to send Nathan Garrideb away for a while, he sensed that there must be something at 136, Little Ryder Street that was of immense importance to John, Holmes expected John Garrideb to show up.Meanwhile Holmes and his friend Watson ensured that John did not suspect that they have any inkling of his plans of sending Nathan Garrideb away. Holmes and Watson did put the man at ease by clearing it to him that they were least interested in any matter and won his confidence by showing that they were just to help him in discovering another Garrideb. Expecting John they arrived and hid themselves in the house at 136, Little Ryder Street and did catch John Garrideb.. Examine the subtle humour in the narration of the story that lightens the gravity of the subject matter. The story's wittiest character is the detective Sherlock Holmes whose digressions are most funny. How in the middle of a sensitive interrogation he points out to the suspect that he appears to be a English, though the suspect exclaims that he is an American. In the beginning when Holmes is explaining the case to Watson, he remarks that there is a chance to make money with this case as if it is they and not the Garridebs who will be given the inheritance of Alexander Garrideb. The most interesting part is the style with which Holmes talks or discusses any information. Even while explaining a serious matter he adapts a casual style. For example, again while in the beginning Holmes is explaining the case to Watson, he did not give away the people already involved in the case. However, he tells that Nathan is already taken in as Watson comes across his name in the directory. He did not even tell the name of the mastermind John Garrideb until Mrs. Hudson approached with the card signed by Garrideb. There are many such instances that make the mystery light-hearted and the reader is not burned by it.